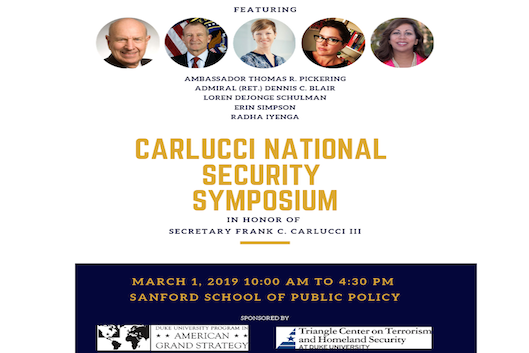 The intent for the symposium is three-fold: to honor Secretary Frank C. Carlucci's legacy and longstanding commitment to public service; to promote Sanford's National Security and Global Policy concentrations; and also reinforce the Sanford School's enduring commitment to diversity and inclusion of women and other underrepresented groups in national security and foreign policy. Professor Bruce W. Jentleson, Sanford Professor of Public Policy, will moderate a keynote discussion with Ambassador Thomas Pickering (United Nations, Russia, India, Israel, Jordan, among others) and former Director of National Intelligence and Commander of the United States Pacific Command Admiral (R) Dennis Blair. The conversation will cover today's national security and foreign policy issues and the Trump Administration's responses. Following the panel, the Bombshell Podcast will host a live taping of their podcast. Bombshell is a popular National Security Podcast produced by War on the Rocks. Bombshell brings together Loren DeJonge Schulman, Radha Iyengar Plumb, and Erin Simpson to unpack the latest national security and defense issues.